The unique and reliable Vertigo Cyclone Torch Lighter features three wind resistant flames with large flame adjuster and a visible clear fuel tank. So I didn't taste it or draw on it but I gave it high ratings primarily as it's a cheap, reliable lighter. What more can you ask of a lighter? It's travelling with me to Nicaragua on a Cigar Safari and who cares if I lose it or it get's stolen? It's cheap! This lighter has outlasted others I have bought for lots more money! Great deal on this lighter. I have one for every area I enjoy cigars. The best torch lighter I have ever had. Great lighter, easy to operate and good consistent flame. Lights every time. Has a consistent triple flame. Easily adjustable. This lighter outperforms virtually every lighter I have ever owned, many of which cost much more. I have spent literally hundreds of $$$ on name brand lighters only to have them quit working after a short time. This lighter has out lasted all of them hands down. Best $12.00 I've spent it a long time. This was offered from Best Cigars and I needed another one and the price was great! Been using it for a few weeks now and the performance so far is fantastic. Forget the expensive lighter that never work. The Blazer is the best on the market. Price is phenomenal!! This lighter is way Ahead of most... Only 1 in 4 had any issues with so-far. Well worth it. Ty. Cc. This is the most efficient lighter I have ever had..
Great value works just as well as way more expensive lighters and if I loose it no big deal. I have ordered 2 in the past year and both failed to work after a couple of months. I will not be ordering any of these again. They are bad and do not work. This little lighter is quite nice, and it provides an adequate flame for even the largest cigars. One fill can last a good long time depending on how you use it. It is ergonomic also. Great little lighter, especially for the price. Great cheap lighter with no risk. Durable and reliable not to mention easily replaceable at LOW cost. 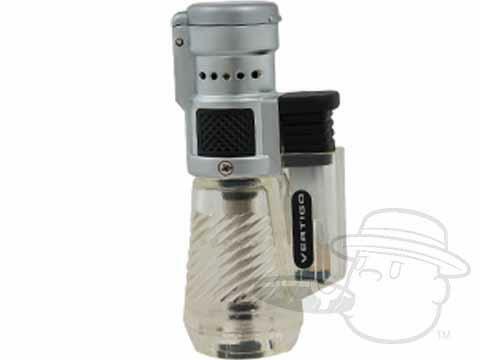 Vertigo Cyclone Torch Lighter By Lotus is rated 4.3 out of 5 based on 30 customer ratings. Our Vertigo Cyclone Torch Lighter by Lotus is 3.5 inches high. What kind if lighter used,,butane or other? This lighter is to be used with refined butane only and is refillable. It will light many many cigars between each fill!